Frog's proposed pay phone replacement for New York City appears like an intelligent and well thought out scheme. I'm usually quick to judge interactive kiosks. How many times do you see pay phones or post boxes plastered with posters or graffiti? A lot, that's how many times. But I have admit, I could imagine this Beacon proposal withstanding NYC style punishment. I can picture it looking distressed or dented but still delivering on its promise of up to date information and services – all the while paying for itself with advertising. Another product I doubted but now take for granted are the stand alone parking kiosks in Toronto. Occasionally you find one out of operation but not that often. In fact, those kiosks are entirely off-grid. Solar powered and using cell phone connectivity these green sentinels are stalwarts of reliability and durability in summer heat and winter storm alike. Imagine what you could do with updated technology, fully powered and connected. Frog's projections of the reliability of gesture and voice inputs may be pollyanna but not impossible. Another aspect to like is the form and footprint. This simple 'twist' with two pedestrian level panels and two larger traffic level panels make so much sense. 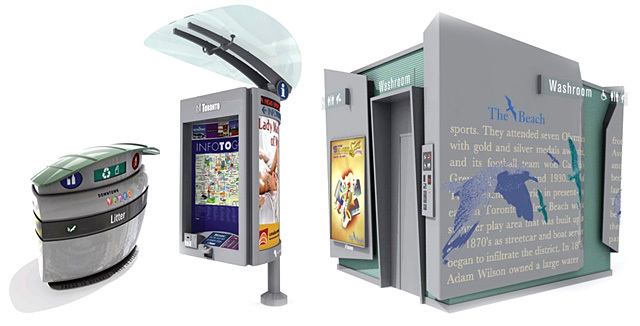 Unlike the horrible Astral Media kiosks that Toronto has been straddled with. Unbelievably awful sort of sums up the Astral street furniture. According to the Co.Design article, this concept was done in response to New York City's call for proposals around what to do when the current pay phone contract expires in 2014. The idea being the concepts would influence the City's RFP. Here's hoping for big ideas. The future deserves it.